How many times have you tossed your ice cream scoop into the sink, pulling out a more hard-core utensil like a knife to extract hard, frozen ice cream from the carton? Or after serving dessert at a party, is your hand temporarily stuck in a claw shape after you pry the scoop from your fingers? You’ve probably seen plenty of tools that claim to be “the perfect ice cream scoop,” but they all seem to have some kind of flaw or poor workmanship that causes them to disappoint. But before you shake your head skeptically and start eating ice cream straight out of the carton again, give the new serrated scoop from Amco Houseworks a second look. This is no ordinary kitchen tool, and at first glance you can see that it is serious about what it does. Simple, stocky, and strong, this may well be just the tool you’ve been looking for to excavate even the toughest ice cream for a perfectly rounded scoop. Priced at only $10.00, the serrated scoop is dishwasher safe too. 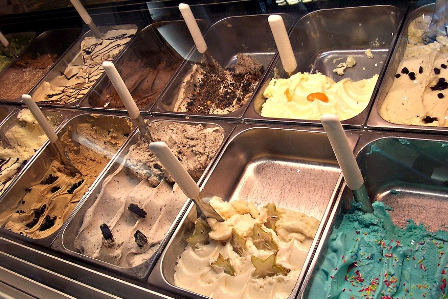 There are two main features that drive the success of this super-scoop. The first is a finely serrated edge, which bites into the ice cream’s surface and digs as deep as you need to go. No more scraping the top and settling for whatever you can knock off the edges! The second feature is the unique, patterned texture of the ice cream scoop’s inside surface. It keeps frozen ice cream from sticking to it, allowing it to fall right out into your cone or bowl without the need for another spoon to scrape it off. There are a few less visible, but also important, modifications to the traditional scoop design. A rubber handle lets you give even more solid leverage to the serrated edge, and will keep you from getting “claw hand” from gripping the handle too tightly. The whole scoop is relatively short, so you have more control and yet more leverage. Finally—an ice cream scoop that takes the frustration out of preparing a delicious bowl of ice cream. On the other hand, you might depend on burning calories while you wrestle with your dessert in order to stay within your diet. Stick with your own methods if you want to, but we are pretty excited about a $10.00 scoop that we can use to do the job with just one hand!